Amaretto Fruit Salad is a cool and refreshing fruit salad that’s perfect for beating the summer heat. Flavored with Amaretto and white wine, this is strictly an adult-only fruit salad. This boozy Amaretto Fruit Salad is great for parties, picnics, brunches, luncheons, and showers. It makes a light and healthy addition to any meal. The Amaretto gives it a wonderful almond flavor. If you don’t have a bottle of Amaretto and are wondering if it is worth buying one, it is. You can make good use of it in baking recipes like Amaretto Cake and Amaretto Cheesecake and in cocktails. You can use pretty much any type of fruit you want to in this Amaretto Fruit Salad. I’ve used pineapple, honeydew, grapes, and strawberries but cantaloupe, blueberries, blackberries, and raspberries work well. Even kiwi or mango. 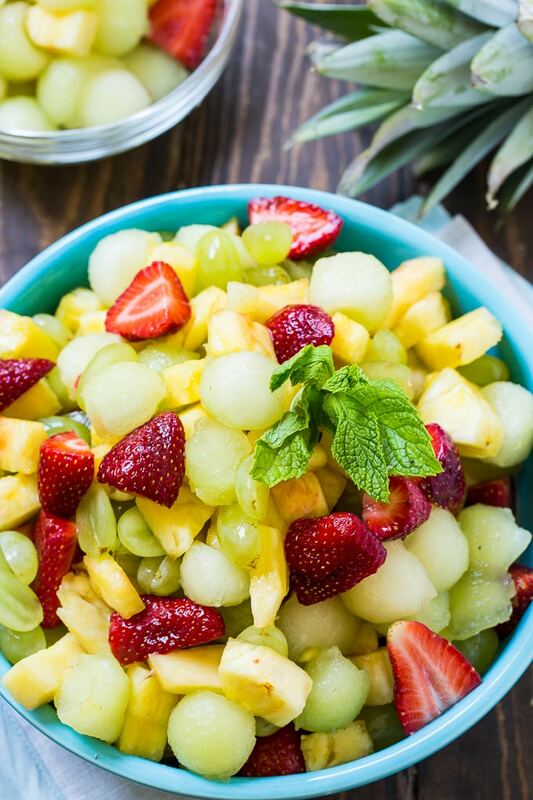 Amaretto Fruit Salad is a cool and refreshing fruit salad that's perfect for beating the summer heat. 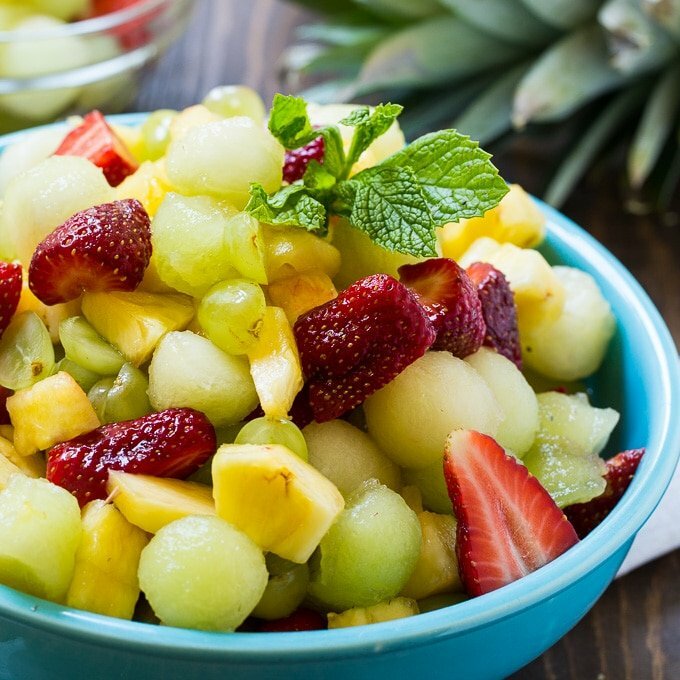 Flavored with Amaretto and white wine, this is strictly an adult-only fruit salad. In a small bowl, whisk together wine, amaretto, sugar, and lemon juice. 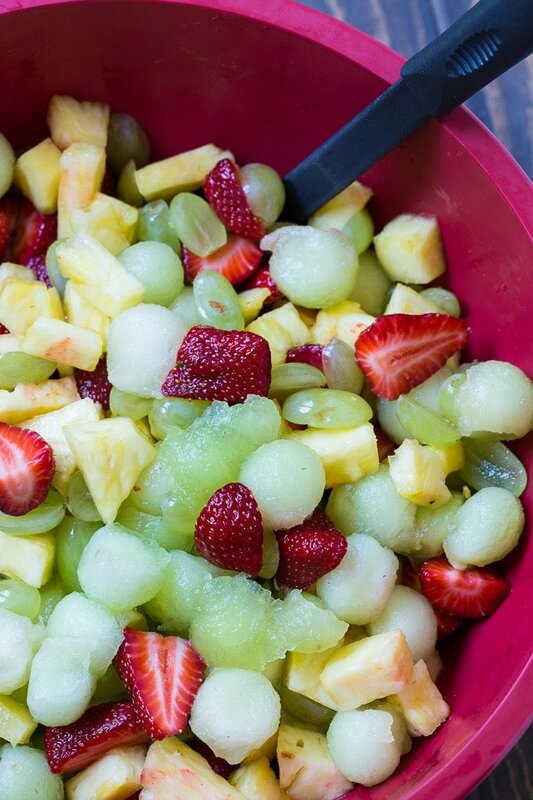 Pour amaretto mixture over fruit. Cover and refrigerate for at least 2 hours before serving. This entry was posted in Salads and tagged amaretto, pineapple, strawberries. Bookmark the permalink. This is one of my favorite quick and easy summer desserts. I like to serve it over pound cake. I don’t usually add wine but will try your version next.